When I was maybe six or seven, I remember my great grandfather saying that he had had the 12 Days of Christmas gifted to him anonymously. He spoke fondly of receiving a gift each day and trying to find out who the giver was (which he never did do). I was so grateful that someone out there was thinking of him as he lived alone and was quite elderly. After this experience, my older siblings and I would often do the 12 Days of Christmas for someone who was in need, lonely, or having difficulties in life. It really made me happy. When I became a teenager, I began doing the 12 Days of Christmas for others as well. My little sister would often join in too. We did it every year for many many years in a row and it became a highlight of Christmas for us. Anonymously drop a gift at their residence each day. Starting December 12th, I’d sneak a gift on their doorstep and ring the door bell or knock and run. Sometimes I’d drop the gifts early in the morning, mid-day or in the evening. Other times, if I thought they’d catch me, and if the gift could stay outside for a bit, I wouldn’t knock so I could escape unseen. The fun part is doing this anonymously. On rare occasion if I had to miss a day, I’d leave two gifts at a time. Anonymously mail them gifts (one or multiple per package) every day or every few days. Now, with online shopping and free shipping options, you could even arrange to gift one or a couple of things at a time on a regular intervals. Start on the 11th and go all the way up to December 23rd. Amazon Prime and other online retailers have very reliable shipping and tracking and will tell you before completing the order when it will arrive. Many have free shipping (Amazon Prime of course is known for that). So by just staggering the orders and sending the gifts with the ‘gift’ options, you can do this from home as well. All of the gifts don’t have to arrive on the designated day. In fact, you could package a few gifts together and send a box every 3 or 4 days. I am seriously considering doing the 12 Days of Christmas as gift options from Amazon (which is anonymous) and order 2 or 3 gifts at a time. Mail them one package of twelve gifts to open each day. When I was on my LDS mission serving in Germany, my mom sent both me and my roommate twelve gifts each. We had one to open each day. They were practical, thoughtful, and fun. We really looked forward to opening them, and that Christmas was so memorable!—Thanks Mom! Put the gifts in a large gift basket and gift them to the recipient all at once. You can simply put all 12 gifts in a large basket and deliver them at once. I saw large gift baskets the other day at a thrift store. Do an Advent type of an idea where the gifts are inside an advent type calendar and then open them one day at a time. The recipient will find a gift behind the door each day. Send a letter each day. You don’t have to give gifts. You could try sending a nice note each day through the mail or drop it off at the door as well. 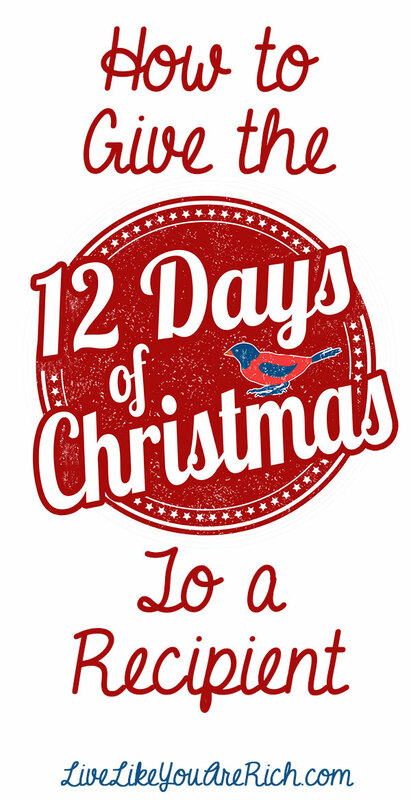 Do you have any other ideas to celebrate and gift the 12 Days of Christmas? If so, please comment below as I’d love to add them to this article. Whichever way you choose to do the 12 Days of Christmas, your recipient(s) are sure to be excited and remember it fondly. For other ‘living rich tips’ please subscribe, follow me on Pinterest, or like me on Facebook. I love this so much! What a sweet, thoughtful, and kind way to serve others for Christmas! I definitely want to do this! I can’t wait to see your gift ideas! Thanks Chelsea! It is such a fun thing to do for others! We did this a few times growing up. It’s such a wonderful way to share the spirit of Christmas with those who may be going through tough times. We even received the 12 days the first year we were married. It was totally unexpected, and each night we heard the knock at the door, my husband ran to open it so he could catch the people and find out who they were. We never did find out who did it! Awe that is so awesome!! It makes me so happy to hear these stories. I’ve never had it done to me but I love doing it for others!! This comment just made my day! Thanks for sharing. Merry Christmas!